Evalyn “Evie” Johnson has traveled the world to share the hair care techniques she’s honed over 20 years as a stylist. She’s taught natural hair styling in Los Angeles and hair-loss prevention in Australia. She’ll be featured in New Zealand next month at the International Association of Trichologists’ Hairdressing Conference. “I do a lot of speaking engagements, so I travel a lot,” said Johnson, 38, of Bowie, Maryland. It is ironic that travel plays such a significant role in Johnson’s life now as a celebrated stylist and co-owner of the E&E Hair Studio in Mitchellville, Maryland. She and her family were once so poor that her parents, Julius and Elizabeth Peterson, couldn’t afford to send Johnson or her 11 siblings on field trips around Washington, D.C.
Johnson attributes the family’s poverty largely to her father’s heroin abuse, which led to his incarceration at D.C.’s prison in Lorton, Virginia. In his absence, the Johnsons lived on public assistance, she said. When she reached adolescence, little Evie rebelled. At 13, she got pregnant by her boyfriend, Antonio Reed, Jr., then 15. They both lived at the city’s homeless shelter at 14th and Park Street, NW. Her mother dispatched her to Lorton to inform her father, the only time she visited him behind bars. Julius Peterson made her promise not to get pregnant again until marriage. In return, he promised to kick heroin. When her son, Antonio Reed III, was 2 months old, he became ill with Kawasaki disease, which causes inflammation of blood-vessel walls. He spent seven months at D.C. General Hospital. Each day, Johnson attended school, then took Metro or two buses to the medical facility, where she studied and nurtured her baby. The Washington Post highlighted Johnson in 1994 for graduating with a 4.0 GPA from then-Kelly Miller Junior High School. She was 15. Johnson had dreamed of becoming a stylist since she was very young. She braided her sisters’ hair, kept her brothers shaped up, and styled her mother, relatives and friends. After beauty school, Johnson worked at area salons before she and Earlisa Larry, who met as stylists at a J.C. Penney salon, opened E&E Hair Solutions in Largo in 2006. They moved a few blocks to the current salon earlier this year. Johnson specializes in natural styles, hair bleaching and hair loss reversal. She co-founded Stuart Edmondson Hair Loss and Restoration, which makes products to improve thinning hair. Johnson also is a master stylist for Mizani, a L’Oréal hair products company, and works as a platform stylist at hair shows. She has coiffed such entertainment notables as Tasha Smith, Ari Nicole Parker, and Trey Songz. She has styled artists for the Grammy and BET awards. 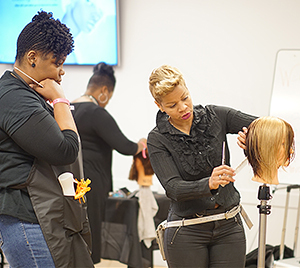 Johnson was scheduled to be a featured stylist at the Washington/Baltimore Area Beauty Expo on Sept. 26 at the Martin’s Crosswinds Banquet Center in Greenbelt. The program was emceed by Johnny Wright, First Lady Michelle Obama’s hair stylist. “She is a premiere educator and very talented at her craft,” Wright said. Clients also sing Johnson’s praises. Johnson and her husband, Joe, a transportation project manager, have four children in their blended family: Taquan, 24, a writer and actor; Antonio, who recently graduated from the University of Pennsylvania; Taleya, 17, a high school senior who answered phones at the salon one recent afternoon; and Jordan, 15, an accomplished basketball player. Johnson said memories of the hard times keep her moving forward. “I’m excelling, but I’m still growing,” she said.